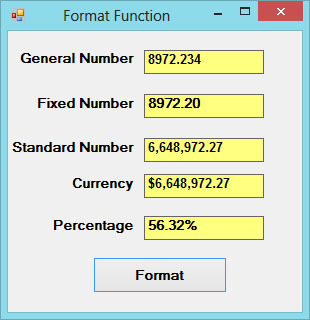 The Format function in Visual Basic 2015 is a very useful formatting function. 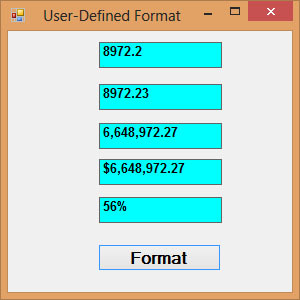 It is used to display numbers in formats customized by the users. For example, to display a number with separators or without separators. It can also be used to display date and time in various formats. There are two types of Format functions, the built-in Format function, and the user-defined Format function. where n is a number. The list of style arguments in Visual Basic 2015 is given in Table 20.1. There are two types of Format functions for Date and time one of them is the built-in or predefined format while another one can be defined by the user. Format (Now, “Long Time”) Displays current time in long format. 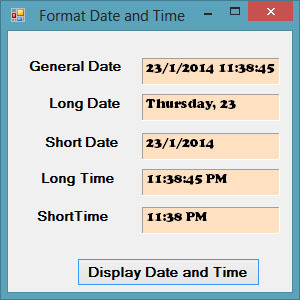 Format (Now, “Short Time”) Displays current time in short format. Format (Now, “mm”) Displays current month in double digits. Format (Now, “mmmm”) Displays full name of the current month. 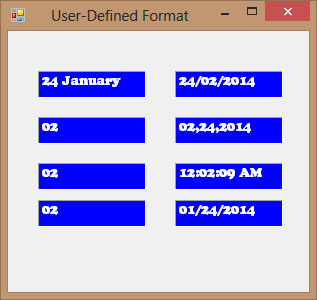 Format (Now, “dd/mm/yyyy”) Displays current date in the day/month/year format.